Take a trip around the empire in celebration of this season’s royal nuptials! This colorful tea provides notes of a week camping in South Africa. Enjoy a masterful blend of rooibos, apple pieces, black tea, wild rose buds, jasmine, cornflower, and calendula petals. Cup Characteristics: Tending sweet rooibos character with lovely hints of hazelnut. Memories of courting and camping in Botswana. 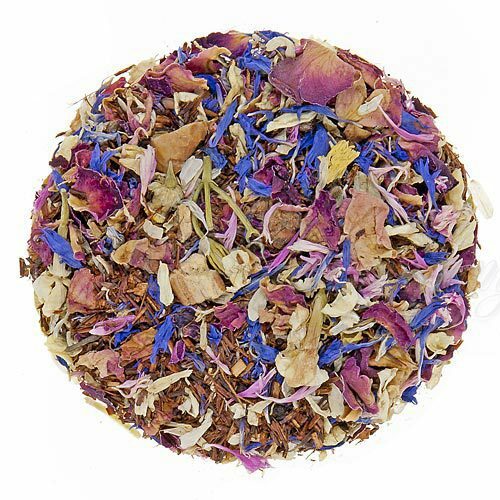 Luxury Ingredients: Rooibos, Apple pieces, Black tea, Wild Rose buds, Jasmine, Cornflower, and Calendula petals. With those words, Meghan Markle sealed the deal on a love story that began when she met Prince Harry on a blind date in the summer of 2016. Part of the courtship was a love camping trip for one week in Botswana in December 2017. Seems the animals sealed the deal. Now, to be sure, a Royal Wedding is not an everyday occurrence. From the outset, there are numerous rules and protocols that must be followed. According to the Royal Marriages Act of 1772, once a proposal has been accepted, all royal descendants who wish to marry must seek the approval of the reining sovereign – in Harry’s case, HRH Queen Elizabeth. Thankfully, according to sources within Buckingham Palace, the Queen was “absolutely delighted” for the couple, bestowing her blessing without hesitation. In homage to the Royal Couple, we’ve crafted a sumptuous tea to delight Royal watchers from London to Kuala Lumpur. And what a tea it is. As a nod to the Prince’s lifelong love for the continent of Africa, we’ve based the blend on a South African Rooibos, selected for its warmth and smooth character – much like Harry himself. To this we’ve added a seasonal black tea, along with stunning jasmine and wild rose buds, both known for their exotic charm – much like Meghan Markle. In the cup, Prince Harry & Meghan’s Royal Wedding Blend is as close to perfection as it gets. Long live the Prince and Princess! Here’s to many happy years ahead. Hot tea: Put 1 slightly heaping tsp. of loose tea for each 7-9 oz/200-260 ml of water in the teapot. Pour freshly boiled water over tea. Steep 3-7 min. Milk & sugar are not recommended. Iced tea: (1 L/Qt) 6 slightly heaping tsp. loose tea into teapot. Pour 1-1/4 cup/315 ml boiling water on tea. Steep 5 min. Quarter fill serving pitcher with cold water. Pour into pitcher straining tea. Add ice, top-up with cold water, garnish & sweeten to taste.